MEBO supports The BLACKSWAN Foundation's RE(ACT) TMAU initiative because it provides "four main axis dedicated to research on rare and orphan diseases: Learn, Meet, Share and Support." 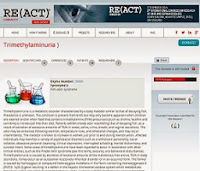 The RE(ACT) effort can be supported by affected persons registering as followers in order for in order for the disease to become unlocked, so that sufferers can have the opportunity to give a description of the disease and its symptoms and for it to become "research projects ready for funding." Once unlocked, sufferers will have the possibility to raise awareness by sharing their personal experiences with the disease. These steps lay the groundwork for fundraising. Not all sufferers are in a position to significantly contribute financially to the substantially large funds needed to carry out research. Nonetheless, funding cannot be understated as essential for research to be carried out, and without research, there will be more of the same with no new treatment options or a cure... Even if unable to contribute financial, each and every sufferer around the world can be proactive in the quest for research by being a part of the MEBO Raising Awareness Campaign. In fact, with a raising awareness initiative, research cannot be organized and carried out. Without an organized community of patients that would be impacted by the outcome of research, a research project will never be funded. It has always been MEBO's goal to unite sufferers and researchers because since this condition draws sufferers into a socially reclusive lifestyle, awareness of the condition has been almost nonexistent and experts simply do not have the pool of sufferers to conduct research, much less obtain funding. It is imperative that all sufferers come out of "hiding in shame" and stand as a united international community in order for anyone to take us seriously. As noted in the UK MRC Gateway to Research The "Patient group MEBO" is registered as the one who will be impacted by the outcome of the research, 'Therapy for the body and breath malodour disorder Trimethylaminuria (TMAU)', which was awarded a research grant of £358,000 GBP (equivalent to 422K/Euros or 552K/USD). Without an organized community of patients that would be impacted by the outcome of research, a research project will never be funded. our united efforts will show researchers and potential financial supporters that although TMAU and other odor-causing metabolic disorders are considered to be rare diseases, the international MEBO community of sufferers is a cohesive, well organized, inspired and proactive community determined to exhaust all avenues to find an effective treatment and cure. No matter which research project you wish to financially support, all sufferers around the world are strongly encouraged to participate in the MEBO Raising Awareness Campaign by telling their story at every fundraising opportunity. If for no other reason, our united efforts will show researchers and potential financial supporters that although TMAU and other odor-causing metabolic disorders are considered to be rare diseases, the international MEBO community of sufferers is a cohesive, well organized, inspired and proactive community determined to exhaust all avenues to find an effective treatment and cure. The RE(ACT) project, created by the BLACKSWAN FOUNDATION is one of the avenues at our disposal to put into action our pursuit of research and our raising awareness efforts. PLEASE BE A PART OF IT! The BLACKSWAN [Foundation] is based in Switzerland, its principal mission is to provide financial support for research on rare and orphan diseases. Research projects are selected by a Scientific Committee composed by internationally recognised experts. The Foundation is also committed in enhancing the public understanding on rare diseases by promoting information campaigns.